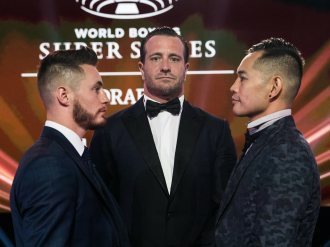 It’s the prospect of unifying the world bantamweight championship that’s fueling Nonito Donaire’s mission to top the World Boxing Super Series and the first step is to dethrone WBA titlist Ryan Burnett at the 13,000-seat SSE Hyrdo in Glasgow, Scotland, on Nov. 3. If Donaire wins, he’ll advance to face WBO ruler Zolani Tete of South Africa and if he prevails again, the end of it all would be to fight for the IBF, WBA, WBO unified crown. The WBC is not participating in the series as its 118-pound throne is vacant. Dropping down in weight hasn’t been a problem. Donaire went all the way up to featherweight in winning the world title in a fifth division after claiming belts in the flyweight, superflyweight, bantamweight and superbantamweight ranks. But he hasn’t fought as a bantamweight since outpointing Omar Narvaez in 2011. Donaire’s father-in-law Gerry Marcial, who’s his chief of security, said the Filipino Flash’s power will be “awesome” in the bantamweight division. Donaire was a bantamweight when he stopped Ukraine’s Volodymyr Sydorenko in four and Mexico’s Fernando Montiel in two. “I’m wondering if Burnett can take Jun’s punch,” said Marcial. Marcial said Woods’ assignment as full-time trainer has done wonders for Donaire. “Brandon’s meticulous and his attention to detail is a big positive,” he said. “He looks at footwork, extension, timing, shoulder movement and the little things that will give you an advantage. Jun’s learning a lot from him and it will show in the fight.” If Donaire hurdles Burnett, the next bout against Tete could be staged in Las Vegas or in the Philippines, depending on which promoter lands the deal. Photo: Burnett and Donaire face off in Moscow last July. Click here to view a list of other articles written by Joaquin Henson.